13 June 2017 - "like you’ve entered an alternate universe"
Jim Steinman’s new musical Bat Out of Hell roars into the London Coliseum for a strictly limited season. 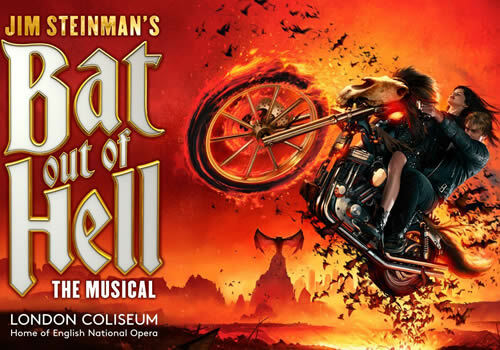 Based on his well-known collaborations with Meat Loaf, Steinman takes the singer’s smash-hit album Bat Out of Hell and transforms it into a romantic, adventurous new musical. Premiering at the Manchester Opera House, the production will plays at the London Coliseum in summer 2017. 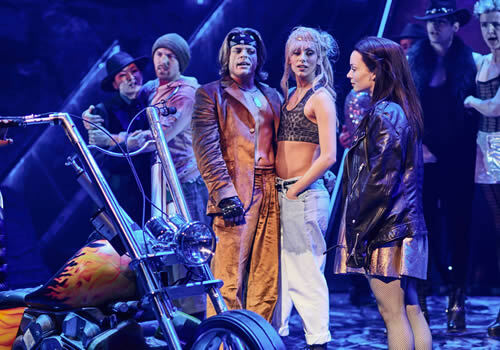 Bat Out of Hell the Musical follows Strat, a rebellious youth who has fallen in love with the daughter of the tyrannical Falco. A high-octane musical that soars through Steinman’s impressive back-catalogue, Strat embarks on a romantic adventure against the backdrop of a post-cataclysmic city. Featuring songs such as “I’d Do Anything for Love… (But I Won’t Do That)”, “Dead Ringer For Love”, “It’s All Coming Back To Me Now” and, of course, “Bat Out of Hell”, this rock ‘n’ roll musical is sure to set the stage on fire! Steinman has a long history in musical theatre, collaborating with Andrew Lloyd Webber in 1996 to provide the lyrics for Whistle Down the Wind. Previously, Steinman used his songs for a workshop production of Neverland, a futuristic Peter Pan musical, as well as composing the music for European musical Dance of the Vampires, which opened in Vienna in 1997. He is also well-known for penning the Boyzone hit “No Matter What”. Casting for Bat Out of Hell the Musical is yet to be announced. Casting includes Andrew Polec as Strat and Christina Bennington as Raven, alongside Rob Fowler as Falco, Sharon Sexton as Sloane, Aran MacRae as Tink, Danielle Steers as Zahara, Dom Hartley-Harris as Jagwire, Giovanni Spano as Ledoux and Patrick Sullivan as Blake. Ensemble includes Jemma Alexander, Emily Benjamin, Stuart Boother, Georgia Carling, Natalie Chua, Jonathan Cordin, Amy Di Bartolomeo, Jordan Lee Davies, Olly Dobson, Hannah Ducharme, Phoebe Hart, Rosalind James, Michael Naylor, Eve Norris, Tim Oxbrow, Andrew Patrick-Walker, Benjamin Purkiss, Anthony Selwyn, Courtney Stapleton and Ruben Van Keer. Directed by Obie Award-winning Jay Sheib, Bat Out of Hell the Musical has taken years of development to reach its 2017 premiere. Opening at the Manchester Opera House in February 2017, the production transfers to the London Coliseum for a run beginning June 5th, playing until July 22nd 2017. 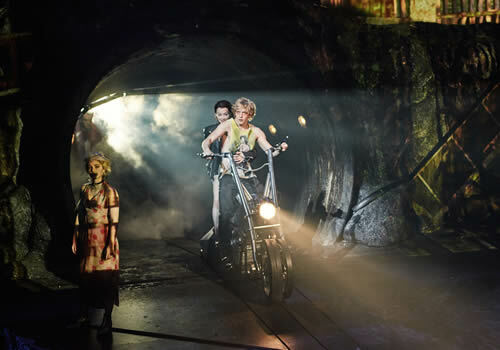 Bat Out of Hell the Musical may not be suitable for young children.